Some unsuspecting consumers can fall prey to the gimmicks of low-priced chimney companies. Remember, if it seems too good to be true, it probably is! You generally get what you pay for. Unfortunately one of our customers was cheated by a "discount" chimney company operating out of the Jackson/Howell area. Not only was the work sub-standard and not meeting current codes; it was unsafe. This company cashed our client's check at a check-casher, leaving our client with no recourse against this company, except for trying to obtain a useless judgment in court. Is their work meeting all current codes? is untrained guessing that the job is done correctly. Liner incorrectly terminated at damper plate, completely bypassing the smoke chamber and causing smoke to pour back into the house. A piece of sheet metal stuck to bottom of liner. This closes off smoke chamber, and is very poorly installed-- will not work! This is for wood burning. The liner is uninsulated and right up against brick-- obviously this does not meet proper standards! Insulation is needed to maintain its UL listing for proper use. This is the top of the fireplace opening with the liner incorrectly meeting it. 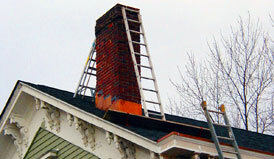 Notice that there is NO DAMPER at the top or bottom of this chimney! Badly deteriorated fire chamber. Nothing was done to repair this. The properly repaired fire chamber. After removal of improperly installed liners, this is what the smoke chamber looked like. Before: A look down at the improperly installed liner. After: Same view; now insulation surrounds the new (properly installed) liner. Looking down at one of the damper assemblies, properly installed. You are looking at the two newly installed chimney pots at the top of the crown. There are now two identical properly installed & insulated liners and two properly installed dampers for this fireplace. Our client can now rest assured knowing the job has been completed the correct way by Certified professionals.